Art Licensing Editorial: Why Should Artists Read Retail Trade Magazines? If artists do not sell products to consumers, why should they read magazines aimed at retailers? The reason is that retailer publications show new products, discuss what is trending and what products consumers are purchasing. Thus, artists will learn what art to create that consumers want and have a better chance in licensing it. Another reason to read the publications is to find manufacturers that license art. Many publications have links to manufacturer websites. Artists can review the websites and see if the manufacturers use art on their products and determine if they licensed it. Note: Not all manufacturers list the name of artists who create the art on their website. But if they are listed and numerous names are shown then most likely the manufacturer licenses art. Also if there are no names shown but there are numerous art styles used on the manufacturer products then the art may be licensed. Simple graphic designs on products are usually either purchased or created by in-house designers. Also, a couple of publications websites have videos that show and discuss products in trade shows, interviews with various manufacturers, and discussions by related industries such as Leatrice Eiseman, Executive Director of Pantone Colors (2016 NSS presentation about color combinations). 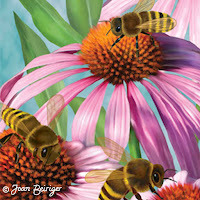 The videos have valuable information that helps artists create licensable art. Note: Some manufacturers also have videos about their companies on youtube.com. Those videos gives insight into the manufacturer product lines, how they produce their products, what is selling, etc. Search youtube for specific manufacturers to see if they have posted a video(s). Examples are Demdaco (Willow Tree Family Groupings), Ne’Qwa Art (hand painted glass), and Robert Kaufman (fabric). 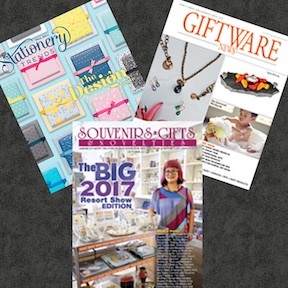 Below is a list of mostly gift retail trade publications. By searching the Internet trade there are trade publications for all kinds of products such as for tabletop and for bathrooms. The following retail trade magazines have information for retailers on how to grow their business. Many also feature products, discuss trends, have trade show calendars, and links to digital issues of their magazines. Has a newsletter that tracks the pulse of the gift industry by surveying retailers across the United States on best-selling products and then sharing that information in national and regional charts. The newsletter is a good way to determine what manufacturers are very successful in selling their products, which means more licensing revenue for the artist. Has an Internet trade publication that shows products, trade show calendar, links to gift manufacturer websites, etc. Has a website and publication that shows new product introductions, consumer trends, market calendar, pre and on going market news articles, etc. Has a website and publication that shows product trends, free digital issues of magazine, videos of manufacturer showrooms (located under resources), etc. Has a website and publication that shows new products, trends, free digital issues of magazine, online gift directory (links to many manufacturer sites that license art), gift show directory, industry news, etc. Has a website that list links to various wholesale suppliers, and has articles about trade show and retail news. Has a website and publication that shows new products, product trends, trade shows calendar, etc. Has a website and publication that shows new products and discuss trends sold in resorts, hotels, and gift stores in parks, zoos, museums, gardens, etc. Has a website and publication that shows the latest trends for greeting cards and social stationery and related lifestyle gifts with access to free digital issues of magazines. It also has interesting interview articles about artists and retailers in the greeting card and stationery industry. And, it has videos about different greeting card and related product manufacturers.